MY SON, MY ONLY SON. Copyright, 1890, by W. F. Shaw. Written by E. W. Rogers. Composed by George Le Brunn. Just five and twenty years ago, how well I know the day. With curses deep I drove him forth to bear his load of shame. Your mother is dead, her spirit has fled to blighter realms of joy. 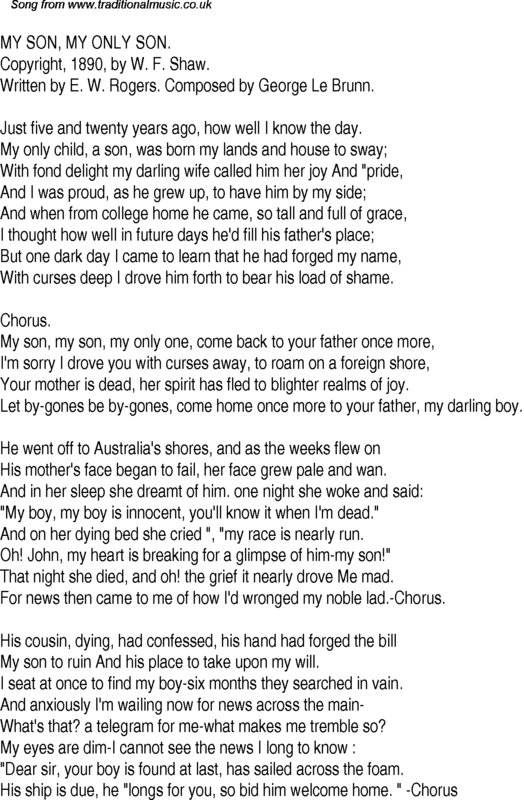 Let by-gones be by-gones, come home once more to your father, my darling boy. His mother's face began to fail, her face grew pale and wan. "My boy, my boy is innocent, you'll know it when I'm dead." And on her dying bed she cried ", "my race is nearly run. Oh! John, my heart is breaking for a glimpse of him-my son!" That night she died, and oh! the grief it nearly drove Me mad. For news then came to me of how I'd wronged my noble lad.-Chorus. My son to ruin And his place to take upon my will. I seat at once to find my boy-six months they searched in vain. And anxiously I'm wailing now for news across the main�What's that? a telegram for me-what makes me tremble so? "Dear sir, your boy is found at last, has sailed across the foam.